Want to be notified of new releases in nhn/tui.editor? toast-ui.vue-editor: Vue wrapper component is powered by NHN. toast-ui.react-editor: React wrapper component is powered by NHN. ember-tui-editor: Ember wrapper component by @evocount. Thanks for their effort. 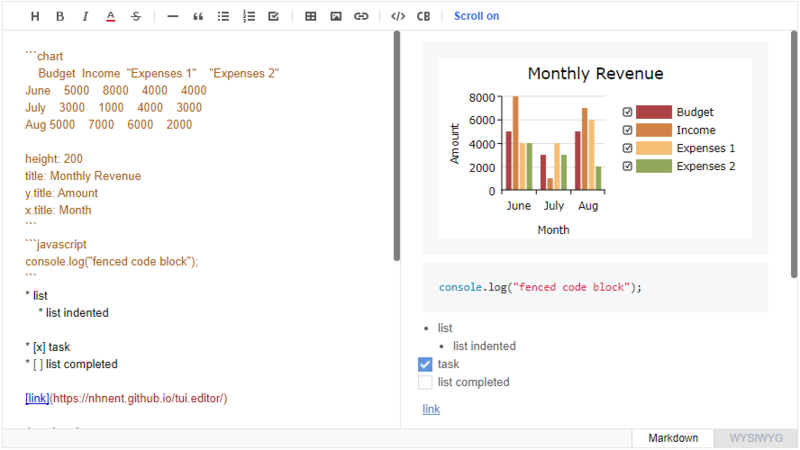 TOAST UI Editor applies Google Analytics (GA) to collect statistics on the use of open source, in order to identify how widely TOAST UI Editor is used throughout the world. It also serves as important index to determine the future course of projects. location.hostname (e.g. > “ui.toast.com") is to be collected and the sole purpose is nothing but to measure statistics on the usage. To disable GA, use the following usageStatistics options when creating editor. Today CommonMark is the de-facto Markdown standard. GFM (GitHub Flavored Markdown) is another popular specification based on CommonMark - maintained by GitHub, which is the Markdown mostly used. TOAST UI Editor respects both CommonMark and GFM specifications. Write documents with ease using productive tools provided by TOAST UI Editor and you can easily open the produced document wherever the specifications are supported. CommonMark and GFM are great, but we often need more abstraction. 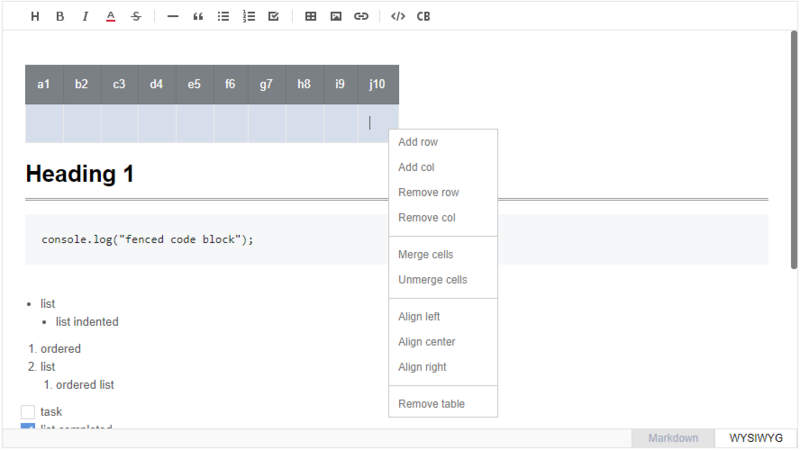 The TOAST UI Editor comes with powerful Extensions in compliance with the Markdown syntax. You also get the flexibility to develop your own extensions using simple APIs. Depending on the type of use you want like production of Markdown or maybe to just edit the Markdown. The TOAST UI Editor can be helpful for both the usage. It offers Markdown mode and WYSIWYG mode, which can be switched any point in time. Copy and paste: Paste anything from browser, screenshot, excel, powerpoint, etc. i18n: English, Dutch, Korean, Japanese, Chinese, Spanish, German, Russian, French, Ukrainian, Turkish, Finnish, Czech, Arabic, Polish, Galician + language you extend. The code provided underneath is for npm + bundler. If you are using bower please see Getting started with bower. Place a <div></div> where you want TOAST UI Editor rendered. Add dependencies & initialize Editor class with given element to make an Editor. or you can use jquery plugin. TOAST UI Editor provides a Viewer in case you want to show Markdown content without loading the editor. The Viewer is much lighter than the editor. Be careful not to load both the editor and the viewer at the same time because the editor already contains the viewer function, you can initialize editor Editor.factory() and set the viewer option to value true in order to make the editor a viewer. You can also call getHTML() to render the HTML. TOAST UI Editor respects CommonMark and GFM. 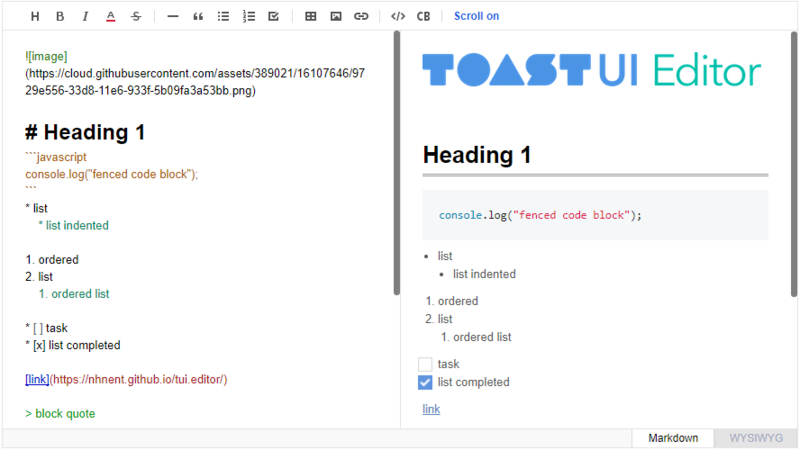 So any Markdown renderer including markdownit can handle the content made using TOAST UI Editor. You can also use any of these renderer in place of TOAST UI Editor Viewer.